Includes 2 ounces of Pappy’s Premium Dubbin in a solid white container. 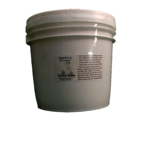 If you are constructing your craft with leather, or maintaining your leather equipment, Pappy’s Dubbin “Makes Leather Work Better”. Softens your leather goods, to make them feel soft and comfortable. Makes leather last longer. Hand crafted, using the finest tannery grade oils and conditioners to make your leather products last. Protects, maintains, and preserves your leather goods, including saddles and tack, leather cycling saddles and hand grips, braided whips, leather shoes and work boots, crafts, tool pouches, belts, baseball gloves, and many more. 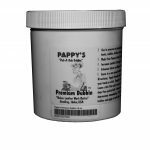 Pappy’s Dubbin Premium is a favorite of equestrian enthusiasts, cyclists, leather braiders, leather whip makers, cowboys, saddlemakers, and crafters.